We’d love your help. 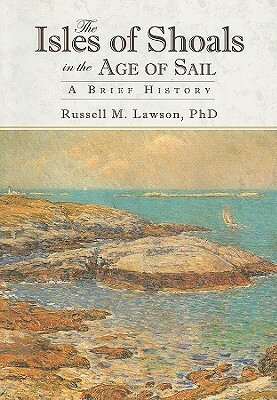 Let us know what’s wrong with this preview of The Isles of Shoals in the Age of Sail by Russell M. Lawson. Off the picturesque shoreline of New Hampshire and Maine lie eight islands collectively known as the Isles of Shoals. Since the famous English explorer John Smith first set foot on them in 1614, the Isles of Shoals have experienced numerous changes. The once thriving fishing communities suffered many hard years before and after the American Revolution. Since the 1800s, the Off the picturesque shoreline of New Hampshire and Maine lie eight islands collectively known as the Isles of Shoals. Since the famous English explorer John Smith first set foot on them in 1614, the Isles of Shoals have experienced numerous changes. The once thriving fishing communities suffered many hard years before and after the American Revolution. Since the 1800s, the Isles of Shoals have been revived as a place where travelers, artists and writers can find inspiration and relaxation. The austere beauty of the rocky shores has influenced such notable figures as Nathaniel Hawthorne, Childe Hassam, Sarah Orne Jewett and the poet laureate of the islands, Celia Laighton Thaxter, as well as lesser-known fishers and fishwives, sailors and visitors of the past and present. To ask other readers questions about The Isles of Shoals in the Age of Sail, please sign up. I am a writer of historical narrative, recreating the lives of people such as the explorer Captain John Smith, the English scientist Thomas Nuttall, the Swiss/Mexican explorer and scientist Jean Louis Berlandier, the missionary explorer Daniel Little, the scientist and clergyman Jeremy Belknap, the American patriot Ebenezer Hazard, and the mountaineer Captain John Evans. I write local histories of I am a writer of historical narrative, recreating the lives of people such as the explorer Captain John Smith, the English scientist Thomas Nuttall, the Swiss/Mexican explorer and scientist Jean Louis Berlandier, the missionary explorer Daniel Little, the scientist and clergyman Jeremy Belknap, the American patriot Ebenezer Hazard, and the mountaineer Captain John Evans. I write local histories of places in New England and Oklahoma. I write and edit encyclopedia. My first fictional work, "The Curse of the Bronze Amulet," set in 18th century New Hampshire, has just been published by Black Rose Writing.